The longer the European politicians think about the events in Ukraine, the more they begin to support the president of Russia. The Czech president said that the events in Crimea could have been much less dramatic if it had not been for the "Kosovo precedent." Czech Republic's ruling party does not approve anti-Russian sentiments in the country and is collecting signatures against the Maidan. Following the announcement that Russian President Vladimir Putin may enter troops in Ukraine in an extraordinary situation, most Czech newspapers published articles with headlines that read something like: "1968 Again? Save Ukraine." However, less than a week later, more informed comments began to emerge. On Thursday, the press service of the Czech President Milos Zeman (Zeman previously also drew an analogy with 1968) has announced a presidential statement on the events in Crimea. The President believes that these events could have been much less dramatic if it had not been for the "Kosovo precedent" when the autonomous province declared its independence without Serbia's consent. Milos Zeman also supports the federalization of Ukraine, and strengthening the autonomy of Crimea under this framework. The president also repeated in his statement that the decision of the USSR leader Nikita Khrushchev to give Crimea to the Ukrainian SSR was a "stupid decision," Novinky.cz quoted. According to the newspaper Pravó, Czech Foreign Minister and Social Democrat Lubomir Zaoralek was criticized by his colleagues in the ruling Czech Social Democratic Party (CSSD) because he was not sufficiently objective in evaluating the events in Ukraine. His colleagues could not understand why Zaoralek who opposed the placement of U.S. radar in the Czech Republic, was a staunch opponent of the U.S. and supported Russia, has suddenly dramatically changed his position to anti-Russian one. Zaoralek, for example, said that the Russians cannot be issued residence permits because these permits will be followed by Russian tanks. The Minister of Foreign Affairs should understand that everything he says affects the relationship of the Czech Republic with other countries, therefore the Foreign Minister should take an objective rather than extreme stance, his colleagues said at a meeting of the faction. Likewise, Human Rights Minister Jiri Dienstbier was put in place when he linked the actions of Russia in Crimea with the tender for the completion of NPP "Temelin." Dienstbier expressed doubts about the fact that the Czech Republic could entrust this project to the Russian- Czech consortium at the time when "the Russian regime used blackmail and military force." A public statement was made by the former head of the Czech Republic Vaclav Klaus. He called the actions of Vladimir Putin "rational." Vaclav Klaus believes that the U.S. and the European Union provoked the current tragic situation in Ukraine. "People in Ukraine do not deserve the games being played with their country. This reminds me of Yugoslavia 20 years ago," Klaus told reporters in the Czech city of Brno, commenting on the Ukrainian crisis. He said that a tragic bloody conflict was provoked in Yugoslavia from outside. He added that he was afraid that something similar was starting in Ukraine. Along with the usual anti-Russian propaganda campaign, some balanced articles pop up in the Czech press. For example, a Czech journalist Ladislav Zemánek wrote on Protiproud portal that the West has likely miscalculated its Ukrainian operations because Ukraine is falling apart. The EU and the U.S. have once again shown contempt for democracy and the rule of law, sponsoring a further escalation of tensions and encouraging an anti-Russian campaign, wrote Zemánek. The journalist believes that Czechs will pay out of their own pockets for these attempts of the West. Czech entrepreneurs who have contracts in Ukraine will also suffer. The author is wondering why the government is not concerned about the resurgence of the governance model of Bandera and his "forest brothers" who during World War II killed Czechs in Volyn. However, the most striking is the example of solidarity of the citizens of the Czech Republic who fight against Maidan. The site Protiprod organized collection of signatures for the petition "Antimaidan." The petitioners state that they are outraged by the rigid propaganda campaign organized by the Czech government and public media to distort the events in Ukraine. "We are witnessing the attempts to completely manipulate the Czech public and evoke hatred and emotions akin to psychological preparation for war. We cannot continue to suffer in silence and sit back observing the creation of an atmosphere of not only cold, but a real war." The petition is followed by a request to the government for truthful and multifaceted reflection of the events in Ukraine. The authors also appeal to the government asking to stop pretending that the coup against the democratically elected president of Ukraine can be justified. They appeal to the government with the demands to stop hiding the fact that the coup was organized with the financial support, in the first place, of the leaders of the European Union and the United States. They are stating that the EU and USA are fully responsible for the current and subsequent events (Ukraine sliding into the economic abyss, and millions of Ukrainians falling into poverty), as well as the deepening economic crisis in the West. The Czech government is also responsible as, in fact, it supports the Ukrainian armed gangs on the Maidan, international terrorism and the mockery of all the principles of the democratic rule of law, human rights and freedoms, says the petition. 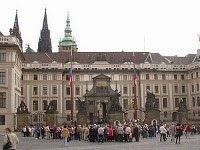 The Czech Republic is a parliamentary republic, an EU member whose coalition government was formed between the Czech Social Democratic Party (CSSD), the movement of "Action of disgruntled citizens" and block "Christian Democratic Union - Czechoslovak People's Party." The above mentioned foreign minister Lubomir Zaoralek mentioned the ban on the entry of the Russians to the Czech Republic and the EU. The Minister of Agriculture of the Czech Republic placed a Ukrainian flag on the building of the ministry. At the same time, he was quick to explain that his country was willing to support trade relations with Russian partners. The new Prime Minister Bohuslav Sobotka made his contribution to the overall trend of criticism of the Russian Federation. He strongly condemned Russia's actions, that, in his opinion, violated the international law in Crimea, but again stated that trade should not be stopped.